Jonny Bairstow said he was proud to score a century on his return to the England team after being “castigated” for being injured. An ankle injury sustained playing football caused Bairstow to miss the first Test on the tour of Sri Lanka. He lost his place as wicketkeeper but returned to make 110 batting at number three on day one of the third Test. “There are bits that people don’t see, yet they have an opinion on it,” Bairstow told Sky Sports. It is unclear what criticism Bairstow is referring to, but he added: “There are different things that you go through when you get castigated about being injured, doing X,Y and Z when people don’t actually see what’s gone on. Football has been part of England’s warm-ups in training and on matchdays for the past three years. Bairstow’s right ankle injury led to him missing the final two one-day internationals against Sri Lanka and, when Ben Foakes took the gloves in the first Test, the debutant made a century to keep Bairstow out for the second. With the only vacancy in the England side for the final Test coming as a specialist batsman at number three, Bairstow registered his sixth Test ton to help the tourists to 312-7 at the close. 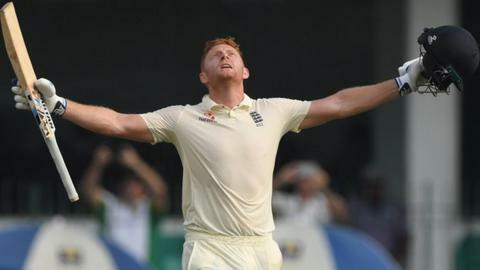 On reaching three figures, Bairstow celebrated with a sustained and emotional roar, dropping his bat to the ground and looking to the sky. “You’ve got to deliver when you’re asked to,” added the 29-year-old. “You get left out of a side when you haven’t done too much wrong over the past couple of years, all of a sudden you’re asked to bat in a role that you haven’t done before, so you’re learning on the job. “You look at the challenges that have been put in front of me as a cricketer. There have been quite a few and I like to think I have come through most of them. It’s been tough. Bairstow also described how recent personal tragedies had given “perspective” to his cricket. “Two people that I know have passed away in the past couple of weeks,” said the Yorkshireman.